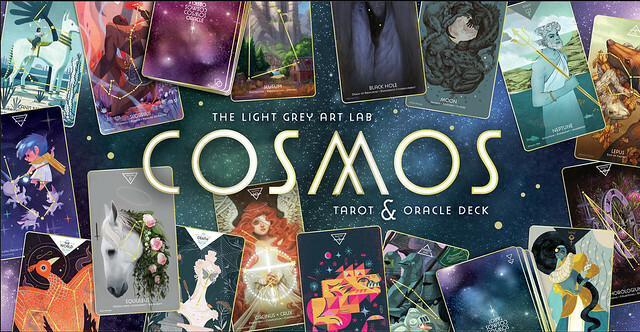 COSMOS Tarot & Oracle Deck Pre-Sale! We have huge news! We are proud to present our newest publication, collaborative artist deck, and comprehensive guidebook that celebrates the modern constellations, planetary influences, and mythology of the night sky! The COSMOS Tarot & Oracle Deck includes the artwork of 100 illustrators, printmakers, and concept artists from around the globe. The project is an interactive tarot deck that is filled with beautiful and symbolic imagery, the history and myths of the universe, and celestial spreads for readings! You can read more about the project below, and see the first view of the project on the Light Grey Shop here. The limited edition COSMOS decks feature gilded edges and gold-foil constellations. The project contains 78 gilded Tarot cards, and 22 gilded Oracle cards, each with quick-reference key-words on the front of each card. 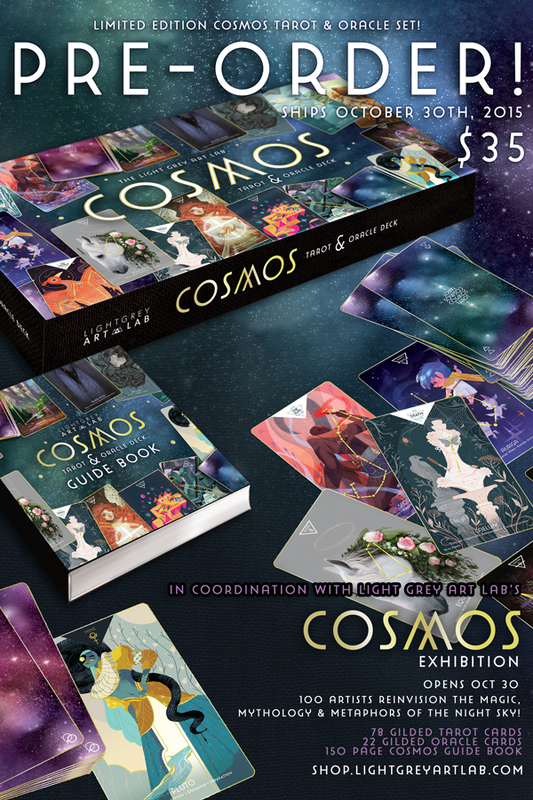 The deck is interactive and includes a 150 page guide to how to read the Cosmos, instructions and guidance for eight different spreads, and information on the history, lore and symbolism for each subject. Mark your calendars for the opening reception and project release on October 30th from 7-10pm. The COSMOS Exhibition will include a massive fiber-optic installation with all 100 pieces. It will be on display through November 27, 2015.